Due to the resort construction structure and your safety purpose, we do not allow any booking with children aged below 10. 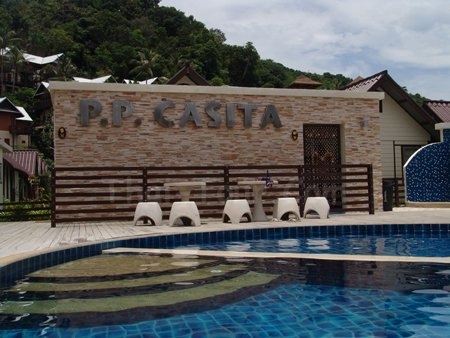 PP Casita in Koh Phi Phi Island is the perfect place for the vacationers and honeymooners to experience a true tranquil vacation far away from the hustle and bustle of the city life. Nestled in the lush green garden, the PP Casita in Koh Phi Phi Island has carved out a perfect niche for itself among other hotels in Ko Phi Phi Island. The bungalow type decoration of this hotel will surely leave its imprint in your mind after you dwell herein. If you want to hang out all day, all night on the beach but would like great value the PP Casita maybe just for you. 60 meters back from the world famous Loh Dalum beach you get location and a well run bungalow complex. Beyond the reception facilities of travel arrangements and island tours the PP Casita does not offer many facilities. It doesn't even have a restaurant but in some ways this is a positive as it it doesn't tie you in to meals and meal times. The village is on your door step where you have an amazing variety of restaurants, bakeries, stores, tour and diving centers. It really is a good place to make the most of the Phi Phi islands.